By utilizing the power of essential oils, plant extracts and other natural actives, Yonka skincare treatments ensure visible, long-lasting results with non-aggressive techniques. Escape into an aromatic oasis of well-being and harmony with one of our customized facials. Winter is over. It’s time to restore your skin! Eliminate problems associated with seasonal changes and feel the radiance of the “new skin effect” with this resurfacing treatment. Enjoy one facial as routine maintenance or follow a 4-session treatment course for maximum results. Save over 15% on a 4-session treatment course now! Call for details. Refresh and awaken tired, drab skin! This customized facial features a 5-step deep pore cleansing regimen and blackhead extraction, leaving you with perfectly balanced skin and a radiant complexion. Perfect for all ages and all skin types. A firming, contouring facial providing optimal lift effects for age-defying beauty. Recommended for individuals 45-55 years of age. Sometimes our skin needs a drink! This ultra-hydrating, refreshing treatment controls the effects of extreme moisture loss. Skin feeling super thirsty? 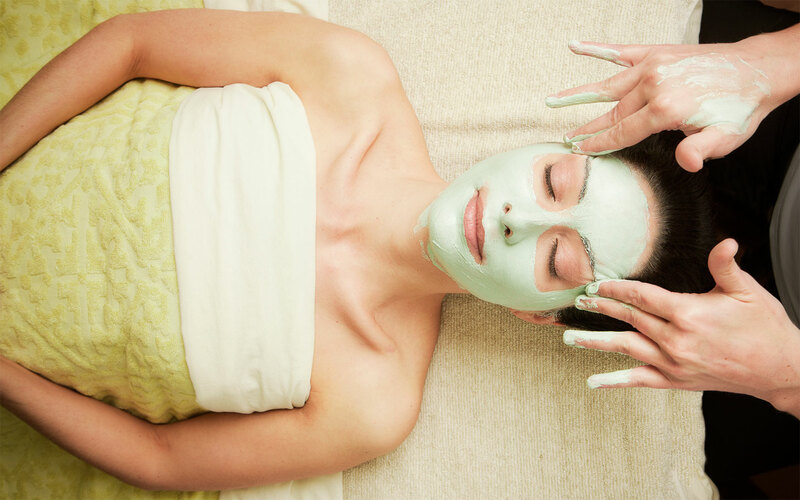 Try one facial per week for a month as a treatment course for extreme dryness. A repairing and regenerating treatment for fragile over-treated skin, this gentle facial will soothe even the most agitated skin. Routine care is recommended once a month, or once a week for a month as a treatment course. Purify and balance blemished skin. Acne, spots andmicrocysts are targeted during this gentle, deep-cleansing facial leaving skinclearer and smooth. Need a quick pick-me-up? This flash beauty treatment includes a facial cleansing, a soft peel and a revitalizing cream in just 15 minutes! Your skin will thank you. Protect your skin from daily elements. Detoxify and conquer the effects of free radicals and pollutants with our environmental defense facial. Specifically recommended for smokers and city dwellers. Take the first step towards maintaining youthful skin. Recommended for individuals 35-45 years of age, Elastine will help eliminate superficial wrinkles and smooth your complexion. Treat yourself to a little “me” time. Relax and enjoy an extremely hydrating facial escape with the cocooning indulgence of hot stones. Ideal for anyone looking to destress and boost dull, dry skin. The perfect solution for sensitive or hyper reactive skin due to cold, dry weather and rosacea. This personalized calming treatment is designed to diffuse redness and reinforce the skin’s natural defenses to reduce your skin’s irritability. Whether you struggle with acne scars, a dull complexion, problems with seasonal changes or fine lines and wrinkles, this facial can do it all. Alpha Vital produces a “new skin effect” and instantly improves skin by restoring a healthy cell renewal cycle. Planning a summer vacation? Don’t forget your Hydrasun facial, for pre and post sun exposure. Protect your skin before and after your beach vacation and enjoy lasting sun-kissed radiance! Plump, smooth and reduce wrinkles with this high-performance treatment for mature skin (age 55+). By combining firming and lifting care with a double deep exfoliation and a biocellulose mask this facial produces noticeable results. Enjoy one facial as routine maintenance or follow a 4-session treatment course for maximum results! Perfect for old or new scars located on the body or face, this service promotes intense regeneration of the skin. Treatments should be scheduled once or twice a week for a month depending on severity of the scar. Verve uses the Nufree wax system, THE gold standard in hair removal. It was developed over 25 years ago to help plastic surgeons remove patients' hair before surgery. Nufree is NOT A WAX and never sticks to the skin, so it hurts less! It is completely BOTANICAL and safe for the entire body. Nufree is antibacterial and antimicrobial so its safe, clean and germ free. Nufree is clinically tested and uses no animal products. If planning a waxing appointment, please allow 7-10 days of hair growth. If possible, exfoliate skin before your appointment and refrain from applying any lotion. Please note there will be an additional charge if trimming is necessary before waxing. We offer a full line of waxing services including bikini wax, brazilian wax, eyebrow wax, lip wax, back wax, chest wax and underarm wax.